It will be open, with free entry, from Monday to Friday, from 10am to 6pm. 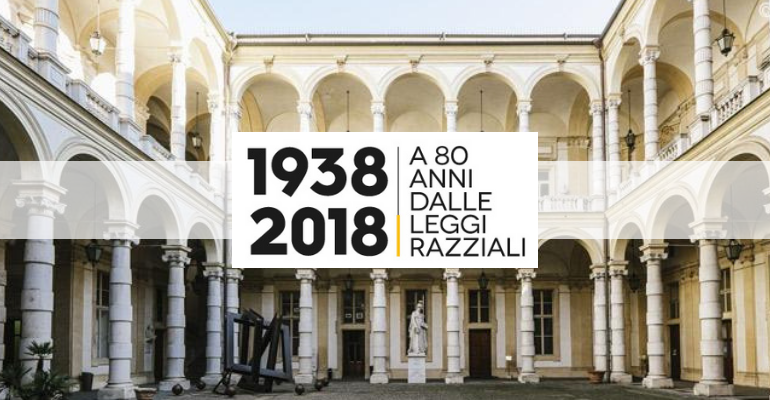 Among the events there will be exhibitions and conferences, “1938-2018.A 80 anni dalle leggi razziali”, whose main exponent is the Museo Diffuso della Resistenza. The Università degli Studi di Torino organizes the exhibition Scienza e vergogna. L’Università di Torino e le leggi razziali in the sala Athenaeum of the historical library “Arturo Graf” inside the Palazzo del Rettorato (entrances: via Po 17 and via Verdi 8) in Turin. The exhibition expresses the awareness of the dramatic relation that the university had with this crucial moment of Italian history. The project of the exhibition, by Giacomo Giacobini, Silvano Montaldo ed Enrico Pasini of the Sistema Museale di Ateneo, and with the collaboration of Paolo Novaria of the Archivio Storico, reflects the ambiguity of the relation of the university of Turin with this aspect of the past. The university of today identifies with the victims, the university of then, which is the same of today from the institutional point of view, was justifier and executor, cooperating in defining the scientific, or pseudo-scientific, framework which prepared laws; which from the administrative point of view put in execution, with the utmost diligence, the action of driving away people who were discriminated and welcome the ones who took their place. In addition, through students and teachers, it supported racial propaganda and mobilization, adding more hate against the victims. Silvano Montaldo – presentation of the exhibition. The visit of the exposition will follow. Inside the project 58 biographies of people expelled from the university have been restored. You can find them in the website. Authors of the biographies: Francesco Campobello, Marco Galloni, Pierangelo Gentile, Livia Giacardi, Giacomo Giacobini, Edoardo Greppi, Erika Luciano, Gianluigi Mangiapane, Marta Margotti, Walter Meliga, Elisa Mongiano, Silvano Montaldo, Eloisa Mura, Paola Novaria, Enrico Pasini, Andrea Pellizzari, Luigi Provero, Aldo Sandulli, Giangiorgio Satragni. For guided visits click here. here the Facebook event of the exhibition.